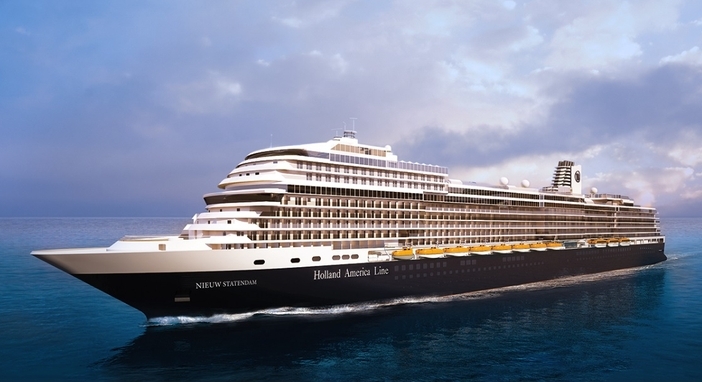 Holland America Line recently announced that its Pinnacle Class ship, the Nieuw Statendam, will be included in its fleet in December 2018. At that time, the ship, which can hold up to 2,666 guests, will unveil its contemporary and luxurious interior, reflecting the tradition of elegance for which Holland America Line is known while introducing beautiful and innovative features. The idea behind the vibrant décor of the Nieuw Statendam is to emphasize fluid lines and spaces that receive natural light. To enhance this effect, the ship will feature a three-tier central atrium, supported by a musical-inspired stainless steel sculpture and ceiling skylight. During the day, guests can look up and admire an ocean-blue sky or gaze upon a starlit backdrop during the evening time. The dining room on the ship will provide diners with views of the sea over its two floors as well. These are areas that feature massive pillars that emphasize the area’s high and impressive ceiling. A two-story wine tower, protected by a copper sheath, will provide guests with a wide selection of fine and notable wines. If you wish to escape the winter cold, the Nieuw Statendam is one ship that can take you away to a warmer and friendlier climate. The ship’s first cruising itinerary will include stops in the Caribbean. Cruisers can set sail roundtrip out of Fort Lauderdale, Florida from December 2018 until April 2019. In the spring of 2019, the ship will embark on cruises to Northern Europe and the Mediterranean. The vessel returns to Florida for Caribbean sailings in October 2019.